Customer reviews are the most important factor in choosing the right professional for any service I seek out and I would expect that choosing the right photographer for your photography needs would be no different. We urge you to read what our customers have to say about their experiences working with us. Photographers serve you during the most important events of your life so it’s no surprise that we become very close to our clients and create bonds that are life changing. I recently had the privilege to work along side of Seth and Audrey for a Newport wedding. The positive energy that this couple brought to the wedding was exactly what everyone should look for in photographers! Seth and Audrey did everything possible to capture every single moment of this beautiful day, even if that meant standing on a table to get the perfect angle for the shot. This power couple is guaranteed to deliver the best images for you to remember your most special day. The passion that these two have for their business shows through their images. I loved working with Massart Photography and I am so thankful to have had a wonderful vendor by my side throughout the day. Thank you Audrey and Seth, I look forward to many more weddings together! Massart Photography deserves more than 5 stars. Seth and Audrey, the lovely married couple and owners, are the coolest. It is SO important to have a good relationship with your photographer who is trust worthy. Seth and Audrey were booked for my wedding, but I got to work with their back up photographer, Nick. Audrey did my boudoir shoot and Nick did the wedding. Audrey made me super comfortable and she's amazing at editing. Nick was my saving grace the day of the wedding. I was so sad when he had to leave at the end of the night. Nick was extremely professional and made me feel very comfortable. Your photographer can be great at taking photos, but the half of it is working with someone who is respectful and calming. I love Massart and their team, they do fabulous work. Seth is also crazy organized and very detailed oriented. Worth every penny for this team! Thank you Nick, Kayla, Seth and Audrey. You made our day so much more special!!! I've said this a dozen or so times during my wedding planning process; having Audrey and Seth as our photographers was and STILL is my favorite wedding investment! Choosing Massart was quite literally the second thing I did as a bride to be and it was within 5 days of being engaged. 🙂 We booked Seth and Audrey in 2015 for our 2017 wedding and never looked back. They have such an aura about them that I knew instantly that they were the only ones I trusted to capture the day. They provide such excellent service that I could rave about them for days. My husband who is not very fond of being in front of the camera, LOVED being in front of the camera with them. The emotion that they are able to capture is incredible. They are so amazing to work with... I look forward to using them many, many, many times in the future. Do your future self a favor and book them, you won't be disappointed! When you are making a final decision for your wedding photographer, there are so many factors to think about and it can truly become overwhelming. My husband and I met with multiple photographers back in 2012 when we were making a decision for our 2013 wedding. When we met Seth and Audrey there were no concerns raised. These two have a passion for what they are talented in and always made both my husband and I feel comfortable. To top it off ... 3 years later we still haven't ordered our pictures (but will do so soon!) and they still treat us like they did back on our wedding day. If you are seeking photographers who become truly invested in their clients, and care about the photos they take - then Audrey and Seth are by far your best option. A few of our friends have hired them for their wedding days as well, and they had the same feelings we did about their approach. They will walk you through their processes and won't be obtrusive on your day. They will be genuinely happy for your nuptials and will provide you with the most emotional, raw and creative photos. We want to send a big Thank You to Massart Photography and know everyone will fall in love with them as much as we did! In planning your wedding, you will likely find, as we did, that EVERYONE has some advice to give. 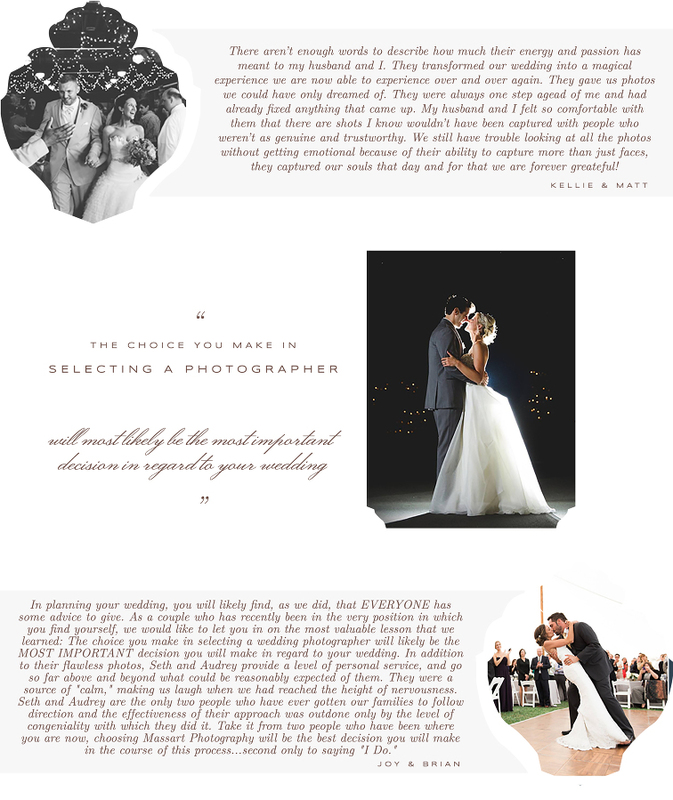 As a couple who has recently been in the very position in which you find yourself, we would like to let you in on the most valuable lesson that we learned: The choice you make in selecting a wedding photographer will likely be the MOST IMPORTANT decision you will make in regard to your wedding. After meeting with multiple wedding photographers and not feeling confident in making a final decision, we set up a meeting with Seth and Audrey. We were about four minutes into the meeting, when we realized that not all wedding photographers are the same. Looking back we cannot imagine what our wedding day would have been like without Seth and Audrey, and their company Massart Photography. When you meet Seth and Audrey, you will learn what we learned: They are incredibly personable and equally genuine, and are kind to a fault. Though their profession is photography, for them, photography is clearly far more than a profession. Whether it is the "formal" photos, or those unexpected and unforgettable moments that make your big day YOUR big day, Seth and Audrey capture it all with masterful skill and an unobtrusive presence. Seth and Audrey's efforts produced so much more than just a series of images. Their work is a perfect visual of every moment and emotion that happened throughout the day. In addition to their flawless photos, Seth and Audrey provide a level of personal service, and go so far above and beyond what could be reasonably expected of them. They were a source of "calm," making us laugh when we had reached the height of nervousness. They were a reassuring voice throughout the day, reminding us to do things as simple as "stopping to enjoy the moment. Seth and Audrey are the only two people who have ever gotten our families to follow direction and the effectiveness of their approach was outdone only by the level of congeniality with which they did it. We have never written an online review about anything...ever. Knowing that, you need to realize that Seth and Audrey are THAT good. They are "I will actually write an online review when I could be watching football" good. As a couple who had to make some tough choices based on our available budget, hiring Seth and Audrey was the best investment we made in our wedding experience. The service and quality of goods that we received in return far surpassed our greatest expectations. Take it from two people who have been where you are now, choosing Massart Photography will be the best decision you will make in the course of this process...second only to saying "I Do." Audrey and Seth are amazing! As soon as I met with them, I knew that I wanted them to be our wedding photographers! They are so down to earth and genuinely nice people! When it came time to do our engagement photos, they were so easy to work with and made us feel comfortable during the photo shoot! Seth is so funny and always made us laugh and Audrey is just the nicest person ever. On our wedding day I felt so comfortable knowing that they were the ones to capture our big day! They got so many pictures of everything going on and you could barely tell that they were there! Not to mention, the pictures came out gorgeous! You can tell that they love what they do and they are so good and professional about it. They take pride in how their pictures come out and it definitely shows! We definitely plan on using them in the future and I would recommend them to anyone!! Everyone in the wedding party commented on how nice Audrey and Seth were, and how comfortable and easy it was to work with them! And everyone that has seen our photos says how stunning they are! I highly recommend Massart Photography to anyone looking to have amazing pictures done. They are very accommodating and did a fantastic job with every piece of capturing our special day. We used them for our engagement session, full wedding day, and boudoir photos. Everything about all of the pictures we have are simply perfect. We will cherish the photos for the rest of our lives. My friends and family were so impressed with the overall final product that they were begging for copies for themselves! Audrey and Seth were always so friendly and easy to work with. It was lots of fun, too! One thing that made planning a wedding and keeping up with everyday was life was the very easy communication with the two of them. Whenever I had a question and wanted to meet, they would get back to me so quickly, no questions asked! It made life so much easier for me. I cannot begin to say enough about Massart Photography. I had first found out about Audrey and Seth through a friend and a shoot they did with their family and knew I had to have them when I got married one day. Between the lighting, softness of the photos and the shots that they were able to get of everyday family photos, I was intrigued to see what else they could do. When it came time for my wedding years later, I knew exactly who to look up. When we first met Audrey and Seth on Skype (we were in Cali at the time), I knew they were a perfect fit. From their personalities to their professionalism and true talent, they make the perfect photographers for any event. I chose to do a boudoir shoot for my husband before our wedding, which I was extremely nervous about. Audrey made me completely comfortable. We were laughing and just having a good time throughout the whole shoot and the pictures came out beautiful. On our wedding day, as any bride and groom, we were all over the place. Seth was making us laugh, putting our nerves as ease. There is never enough time in the day, but with Audrey and Seth's help we were able to get the perfect photos through the streets of Boston and in the Park. We had not even though about going outside the hotel and could not be happier about letting them take the lead on what to capture our special day. With our coordinator pressed for time, they made sure that we didn't rush or feel rushed and got the photos that we would want. We have the perfect photos from a perfect day; the elegance and happiness that they captured is more than we could ever ask for. I cannot wait to go back to them in the future once we expand our family! 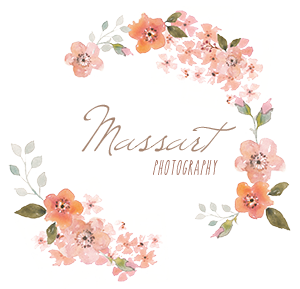 I truly recommend them for any occasion: wedding, engagements, family, baby, boudoir, etc. With this team you will not be disappointed!